On the theme of reviewing health education materials on ebola (and generally) per 2Ds&4Rs, here are some examples of why it is important. 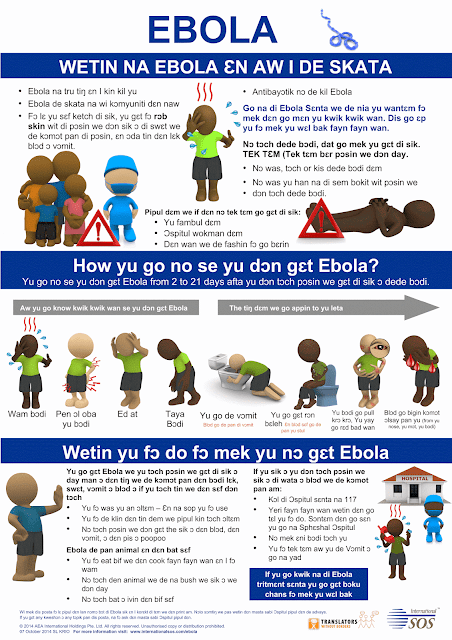 The other Krio poster comes from the US Centers for Disease Control and Prevention (CDC) collection. 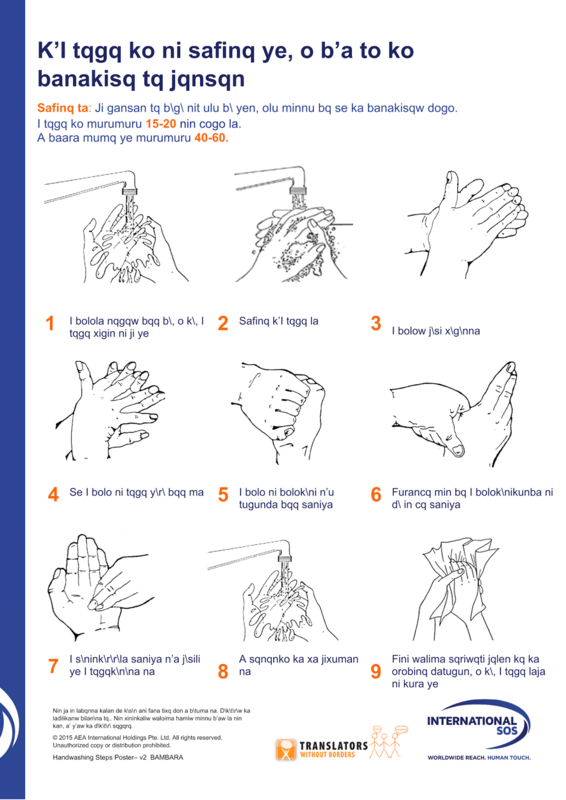 Second, is a Bambara translation of instructions on hand-washing, again from the International SOS site. It seems to have been a good translation, but produced with an old 8-bit font (apparently Bambara Arial), which when printed or converted to .pdf on a computer without that font, produced the odd and unreadable results you see. In the age of Unicode, this shouldn't happen. At some stage such efforts in African languages need to be reviewed, just as materials in English or French would be. Not to find fault, but to correct and also to identify the types of problems to watch out for in future such work. This can be done in the context of an archive of African language health education materials, but another issue is how to build in review of such materials before they get disseminated. Wow, that Bambara poster is pretty bad. I'm assuming you've contacted the creators alerting them of the problem? Thanks Matt, So bad in fact that it could have been flagged for attention by someone with no background in this particular language. I finally got around to editing it and forwarding to TWB (and sent note to ISOS which does not offer an email I could see to which to forward the documents). This is just an extreme case. What concerns me after looking at a bunch of ebola posters in African languages (from diverse sources, per earlier posts on this blog) is that there does not seem to be any system for reviewing & revising such materials before or even after dissemination (per the 2Ds+4Rs I keep harping on about). I wonder also about dissemination of the meterials - do they get used as much as they could be? And can one get feedback from people and medical professionals about the quality and ways to improve? That's not to take away from the important initiative and work to get materials in African languages, but what is the vision of the process beyond the crisis? Dioula, Jula, Dyula, or Diula?